Life in this class is friendly, fun and fast paced. Mrs Elliott teaches on a Monday, Tuesday and Wednesday. 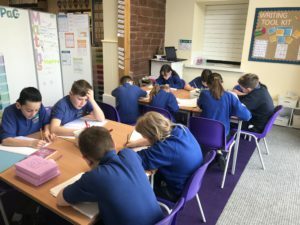 Mrs Davies teaches on a Wednesday, Thursday and Friday. 1.30 – 3.00 Topic / Science / PE etc. Mrs. Elliott teaches PE on a Monday afternoon. Children wear school PE kit for this lesson – royal blue shorts, white t-shirt and trainers. PE is mostly taught outdoors so children are also advised to bring extra layers for colder weather. We also take the children swimming in the Spring term. Please see the link to our PE and Sports Page for further information. Homework is set weekly by both teachers. Homework days vary as we prepare children for life in secondary school. We expect children to be responsible for their own home learning, this includes; reading, Maths, SPaG and projects. Home School Diaries should be signed each week by an adult from home to maintain a strong link. Helen Teasdale, our specialist music teacher, works with the children each week. They develop confidence and creativity during these lessons which support our fantastic end of year productions.